The concept behind Coinstar's innovative coins-to-cash kiosk came to Jens Molbak while he was studying in the M.B.A. program at Stanford University. Jens felt there should be better way to deal with excess coins than stuffing them into paper tubes and taking them to a bank. We consulted with Jens on the technical feasibility of his idea. Jens then raised funds to hire a large product design firm to design and build market research prototypes. Several months later, we received an urgent call from Jens. His project was in trouble, because the kiosk software was not working, and the critical Thanksgiving test period was just a couple weeks away. SK came to the rescue by working in-house at the large design firm to identify what parts of the design could be saved and what parts needed to be re-done from scratch. After several days and nights of programming, the proof-of-concept kiosks were ready to go into a few local supermarkets to find out if people would pay a commission to have their coin jar contents turned into useful cash. The market tests were very successful. With the market test data in hand, Jens was able to raise additional funds to develop a kiosk for mass-production. Jens turned to SK to design the first production kiosks. We worked with Jens to refine the system architecture, the user interface, the data network, and the coin processing hardware. We assembled a team of engineers, both hardware and software, and teamed up with an industrial and mechanical design firm. Over a period of six months, we came up with the architecture, designed the electronics, and developed all the software for the production kiosk. The core of the Coinstar machine is an embedded PC running QNX (later versions switched to Windows NT). The PC interfaces to a custom IO board that handles real-time tasks and the keypad, a thermal printer for printing vouchers, the coin counting mechanism, and a modem which uploads accounting and service information to Coinstar headquarters. We have done several follow-on projects for Coinstar: developing the technology for a new coin counting sensor that was ultimately patented and a help phone compliant with international communication standards. 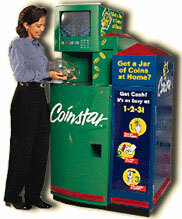 Coinstar became a public company, and now has more than 10,000 kiosks in the U.S., Canada and Europe. In 2002, Coinstar's networked kiosks processed a total of 33.2 billion coins worth $1.7 billion! Read about Coinstar's patents and awards.